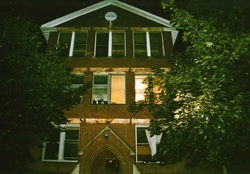 Our investigation focused on the 3rd floor ballroom, the balcony, Room #7 (molestation room), and the basement. We captured several interesting EVP's, which can be found on our audio page, and also some anomalous EMF readings. Kevin also received some relevant responses during his ghost box sessions. The Youngstown Playhouse is the oldest continuously operating community theatre in the United States. The Playhouse originated in the mid 1920's by a theatre group called The Youngstown Players and later became known as a training ground for professional actors. Today we add another chapter to the Youngstown Playhouses already rich history with video and audio evidence gathered during our paranormal investigation there. We captured several evps and light anomalies, and unexplained equipment malfunctions. Personal team experiences include: audible voices and sounds, feelings of uneasiness, and nausea/vertigo in certain areas of the building. We have several other investigations in the works, both private residences and another possible business location. We will update as soon as data has been gathered and analyzed.